The National Air and Space Museum online collection includes thousands of artifacts that aren’t on display. National Air and Space Museum can now tap our web address (airandspace.si.edu) into their smart phones to find out more about many of the air- and spacecraft they see on display. From these online records, people can learn about an artifact’s significance and find its location in the Museum. In some cases, the online image collections show views of an artifact that visitors cannot see in the gallery. The page for the Boeing B-29 Enola Gay, for example, features dozens of photographs of the aircraft interior. Soon our visitors will find more stories and resources online. As part of a Smithsonian-wide policy to make more information about the institution’s artifacts available on the Internet, the curators and digital media team at the Museum are expanding its online offerings. We will provide images, short histories, and audio and video stories for more of the 6,000 items now on display at both of our locations. The National Air and Space Museum collection, however, is much larger than the items we are able to exhibit. The Museum holds in trust more than 60,000 artifacts. To educate the public about the full collection, we have placed thousands of photographs on the Museum’s searchable website, many accompanied by short essays explaining the object’s historical context. 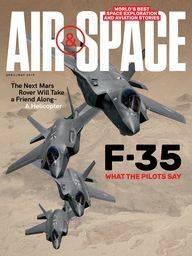 In this issue, for instance, you’ll read about 19th century military rockets designed by William Congreve, which inspired the phrase “the rockets’ red glare,” during the bombardment of Fort McHenry (see In the Museum). In 1976, we received as a gift from the Science Museum of London a model of one of the rockets that the British used during the War of 1812. On the website, you can see what that rocket looks like and find its weight and range. Some of the Museum’s most historic items are also its most fragile. 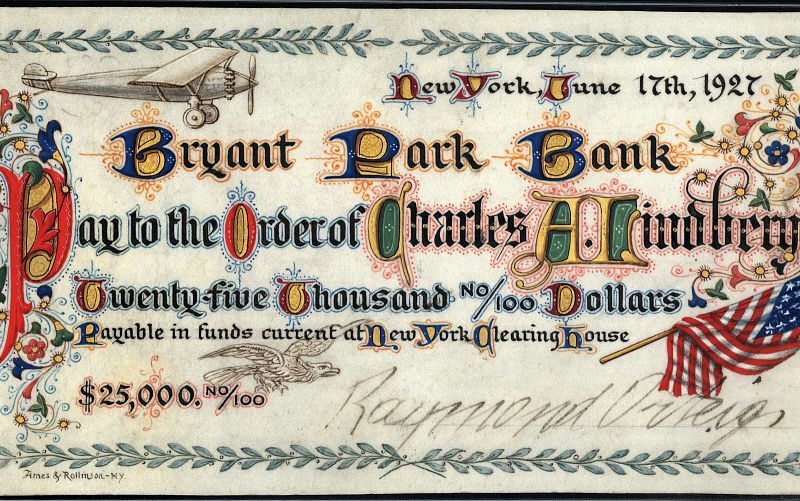 The $25,000 check presented in 1927 by Raymond Orteig to Charles Lindbergh for completing the New York-to-Paris flight is magnificently illuminated on delicate parchment. Be sure to view the color photograph of this item online; part of its decoration is a small drawing of the Ryan NYP Spirit of St. Louis. One of the benefits of our online collections is the ability to draw together objects all related to a single theme but physically located in different places in the Museum. In our Apollo 11 online collection, you will see 156 artifacts. Some are in storage; others are on display at the Steven F. Udvar-Hazy center; and still others are located at the Museum on the National Mall. Taken together, these artifacts tell a comprehensive story about the greatest program of space exploration in history. Many objects now in storage are headed for display in the future, but you can view and learn about them today by finding them online. All of us at the National Air and Space Museum hope that you will one day visit us in person, but until then, we encourage you to be virtual visitors and take advantage of the many online exhibitions now available and the many more that are to come.